Lookingglass Theatre Company announces the extension of Lookingglass Alice due to overwhelming demand. Lookingglass Alice now runs through February 22, 2015 at Lookingglass Theatre Company, located inside Chicago’s historic Water Tower Water Works, 821 N. Michigan Ave. at Pearson. Tickets go on sale today, January 30 at 12:00 p.m. Tickets can be purchased through the box office at (312) 337-0665 or www.lookingglasstheatre.org. Adapted and directed by Ensemble Member David Catlin from the works of Lewis Carroll and produced in association with The Actors Gymnasium, Lookingglass Theatre’s signature production has been seen by more audience members than any other Lookingglass show. 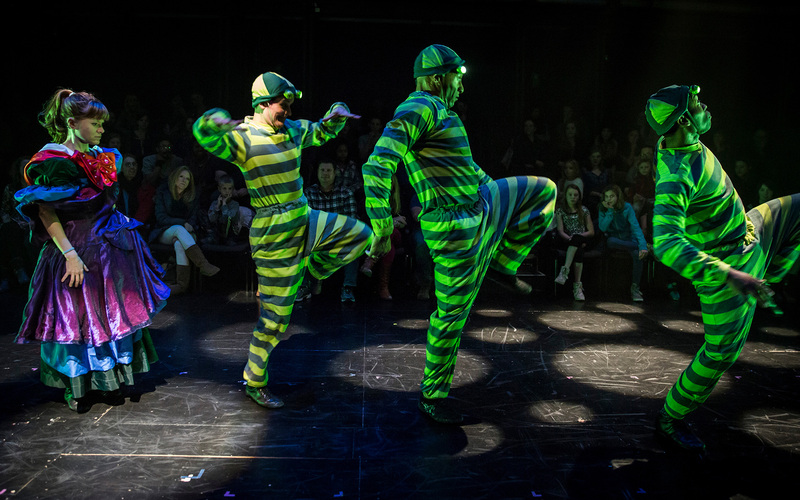 The 2014-2015 run marked Ensemble Member Anthony Fleming III’s 500th performance as the Cheshire Cat, Ensemble Member Kevin Douglas’ 400thperformance as the Mad Hatter and Artistic Associate Lauren Hirte’s 400th performance as Alice. Lookingglass Alice has toured to theatres around the country, including Alliance Theatre in Atlanta, Syracuse Stage in New York, Actors Theatre of Louisville, New Victory Theatre in New York, McCarter Theatre Center in Princeton and Arden Theatre in Philadelphia. Lookingglass Alice features Ensemble Members Kevin Douglas (Mad Hatter) and Anthony Fleming III (Cheshire Cat) and also includes Molly Brennan (Red Queen), Artistic Associate Lauren Hirte (Alice),Samuel Taylor (White Knight) and Artistic Associate Lindsey Noel Whiting (Alice).